Wow, so I kind of abandoned the blog for a few months. I feel like my life completely turned upside down since September, and I’m finally starting to set things right again. It’s mostly been good things, but it was a lot of things at once and keeping up to date on the blog just wasn’t happening. There’ll be more on that later, since it’s some pretty big and exciting news. I did post October and November’s fixes on Instagram, but figured I’d get back on track with December’s fix finally! This is fix #10 for me and I also got a new stylist this month, Christina. Hi Melissa, Welcome back for a brand new Fix! I hope you are doing well this week. Let’s start today with the Kut from the Kloth boyfriend jeans. These are great to wear on laid back days with the adorable 41Hawthorn polka dot sweater and the Octavia scarf. For a comfy look on weekends, try the jeans with the burgundy Laila Jayde top and a pair of sneakers. I read that you were looking for a dress to pair with leggings so I sent the Lemon Tart dress. It’s great with leggings and a pair of ankle booties. Have fun trying on this Fix, Melissa! If you have the chance, I’d love to learn more about you so I can tailor your Fixes to your lifestyle. Use your profile notes to let me know about your daily routine or aspects of your wardrobe that are in need of a refresh. Also, be sure to leave feedback on pieces when you check out. xo Christina. I wasn’t sure about pairing this with the scarf (below) as suggested since it felt too clashy with patterns. I absolutely LOVE the polka dots, but I think this might be a little big/long. It fell pretty much at the widest part of my hips since I have a SUPER short torso. Pretty much everything that isn’t cropped or empire waist is way too long or big on me. I’m really torn on this one – it’s a heavy double knit sweater, but I think it’s just too long both in the body and in the sleeves. Going down a size would probably make it too tight around the middle, so I think I’m going to have to send this one back. Okay, let’s start with the jeans. They’re Kut From The Kloth brand, so they’re super soft and comfortable, but I think they may be a size too big. I know I’ve shrank a little over the past two months, so I may even be between sizes which makes these just a hair too large – I can take them off without unbuttoning/unzipping them. Also, uncuffed, they’re about 2 inches too long, so I have to cuff them so I don’t walk on them though it appears from the style card that they’re supposed to be worn cuffed. I’m kind of torn on these too – I may have a go at exchanging them for a size down since I think they’ll be cute for Spring/Fall with sandals as well as boots and sneakers. The top is probably my favorite piece out of this fix! I love the burgundy color, and the sleeves even have a cute little patch detail on the elbows (just an extra reinforced section in the same color fabric). The cut is just right – nips in a bit at the waist, and flares out for the hips without being too clingy. I know this will go perfectly with the olive cargo skinny jeans I got a few fixes ago too. The scarf! 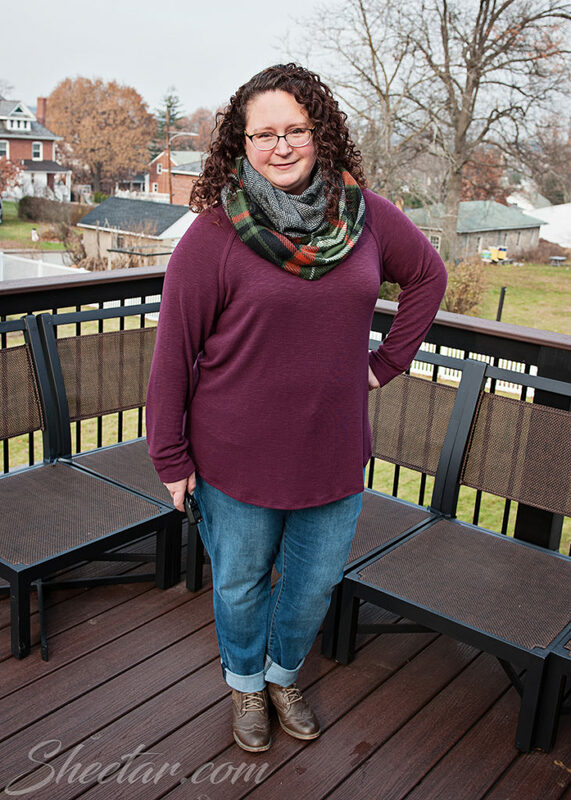 I did want something like this for fall and winter to layer over other pieces, and the colors are so great, not to mention that it’s double-sided with two different prints. Really a nice scarf too. This is a keeper. 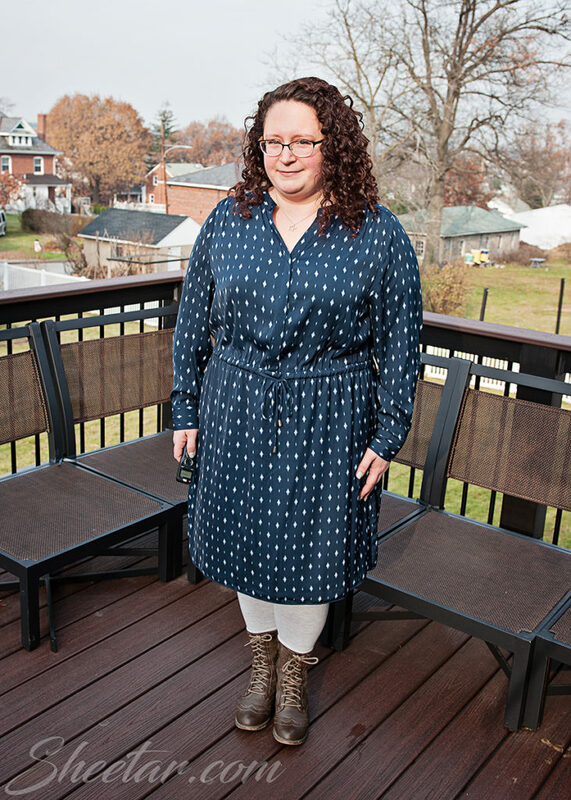 I included two photos to show that no matter what I did, this dress just didn’t fit. It’s the right idea – the print is great and it has POCKETS (!!!!) – however the cut/fit is WAY off for me. Again going back to me having a short torso, any dress with a waist has to be an empire waist or it ends up hitting at the top of my hips. You can see in the first photo, with the dress left to fall where I think it should, it’s scraping the top of my hips, about 4 inches below my waist. In the second photo, I pulled it up a little (still below my waist) and let it blouse over which looks even worse with all the extra fabric hanging there, making me look larger. Nothing I did could make this dress look good on me. It also kind of falls into that unfortunate trap that a lot of plus size clothing falls into – a shapeless sack with a drawstring. 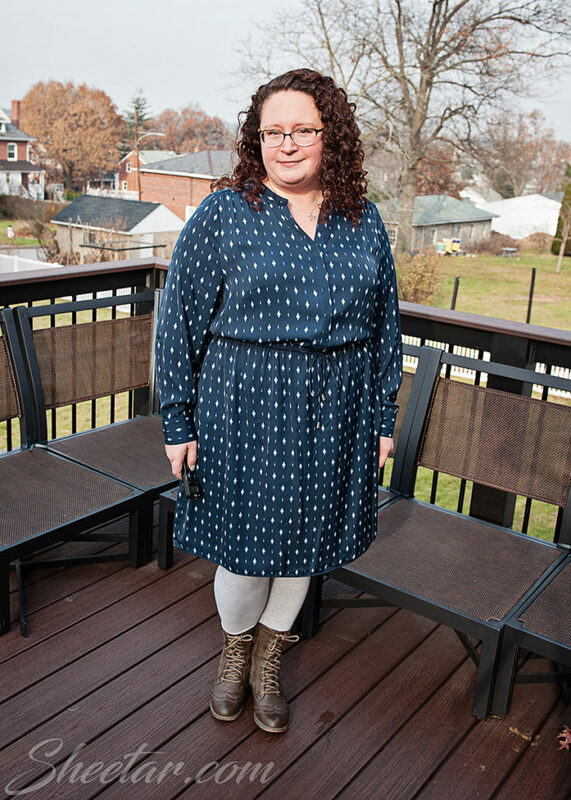 When plus size clothing is structured and fit well, it’s really flattering, but shapeless sacks just makes plus size gals look like shapeless blobs. I get the urge designers have to make clothes that ‘hide’ everything, but sometimes it goes too far. Anyway, I’m definitely keeping the burgundy top and the scarf, and I think I’ll try to exchange the jeans for a smaller size. I know I emailed Stitch Fix before about exchanges, and if for any reason the smaller jeans don’t work, I can return them for a full refund, no problem, which is pretty generous. The dress and polka dot sweater are definitely going back due to the fit issues. I know it’s a little bit tricky for me to find clothes that fit well since I’m both plus size but also teetering on the border of petite and regular misses (petite jeans are too short, misses are too long, but misses “short” length tend to be fine – same with tops). 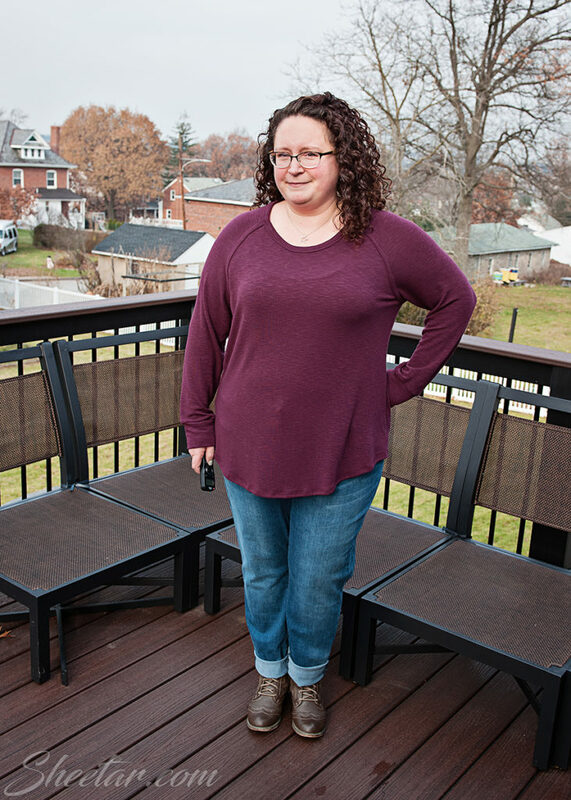 I mean, it’s part of the reason why I’m doing Stitch Fix, so that I’m exposed to new brands that may fit better (Torrid tends to be my go-to since their fit model is basically my body double, but I’d love to have other options), and so that someone else who isn’t me may be able to say, “Hey, I saw this thing that I want you to try, no commitment, but at least give it a go.” I can get a little stylistically stuck in a rut sometimes! Looking forward to what Christina picks for me next month! In case you’re thinking about trying Stitch Fix and want to give me a little love, here’s my referral link! I did get the exchange on the jeans and the size down fits PERFECTLY. I mean, no gap in the back, falls just right across my hips, nice amount of stretch but not too tight. It’s like they were made for me. So glad I gave the exchange a go because they really are spectacular jeans.